Roasted Brussels Sprouts and Butternut Squash mixed together make a delicious baked Brussel sprouts side dish, that is perfect for any fall holiday table! Let’s talk Brussels sprouts. I absolutely hated them until about a year and half ago. I think a lot of people have a similar reaction to them because they’ve probably never had them prepared well. I can attest that preparation makes all the difference! Last year, for Thanksgiving and Christmas, we had maple bacon Brussels sprouts. I am pretty sure that will be requested again this year but I need a vegetarian option for the veggie lovers at our table. So, I will be offering Roasted Brussels Sprouts and Butternut Squash this year. One note about Brussels sprouts…you will see them termed as Brussel or Brussels depending on where you look. I typically refer to them as Brussels sprouts but I know a lot of people use the other version. Just didn’t want you to think I was THAT bad of an editor. This balsamic Brussel sprouts recipe is super easy. You can scale it to fit the size of your party. Roast it all on one sheet pan for a smaller group or separate and put on two sheet pans for a large group! Our grocery store offers chopped butternut squash making it even easier too so be sure to check your produce department for that! Honestly I love this combination of flavors. You can easily add some other herbs or spices to this like rosemary or thyme. I just like it with simple salt and pepper. If you have any leftovers, they are great tossed with pasta and browned butter. 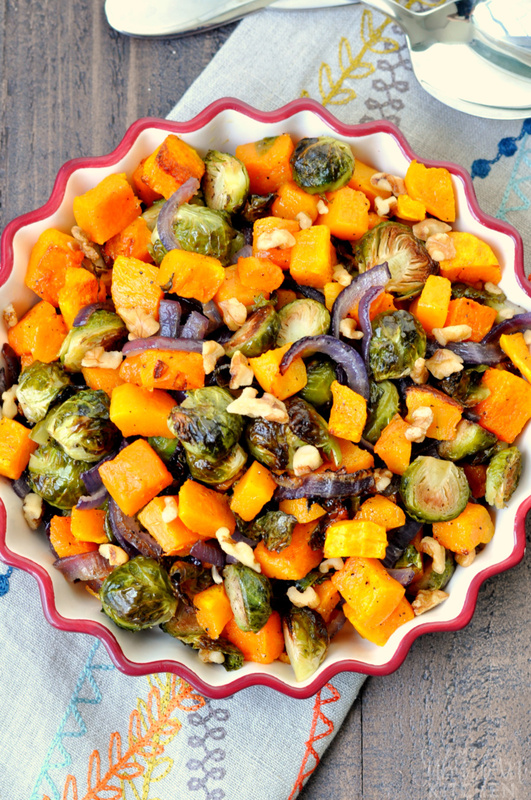 If you make this recipe for roasted Brussels sprouts and butternut squash or any other recipe from the blog, I would love to hear about your experience. Let me know in the comments or snap a photo and tag it #MySuburbanKitchen on Instagram or Twitter. Preheat oven to 425 degrees. Line two large rimmed baking sheets with foil. Add Brussels sprouts and onions slices to one prepared pan. Add butternut squash to the other pan. Divide oil between two pans and toss vegetables in oil. Spread out into single layer. Season all vegetables with salt and pepper. Add butternut squash pan to oven. Cook for 10 minutes. Add second pan to oven and cook for an additional 20-25 minutes. Remove from oven. Toss vegetables together and add chopped walnuts. That is a beautiful dish. I love all of the colors. Brussel sprouts is one of my daughters absolute favorite things to eat. She loves them! Happy Thanksgiving to you. 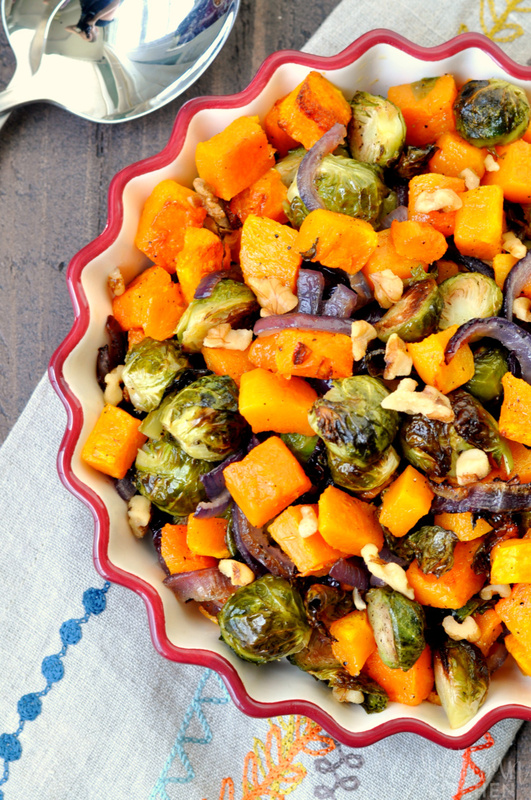 We always have brussels sprouts on Thanksgiving – I love the idea with the squash! Thanks for sharing on the What’s for Dinner Link up! This looks great! I’m gonna have to try this for Thanksgiving. Thanks for sharing at the Monday Funday link up! Yum! 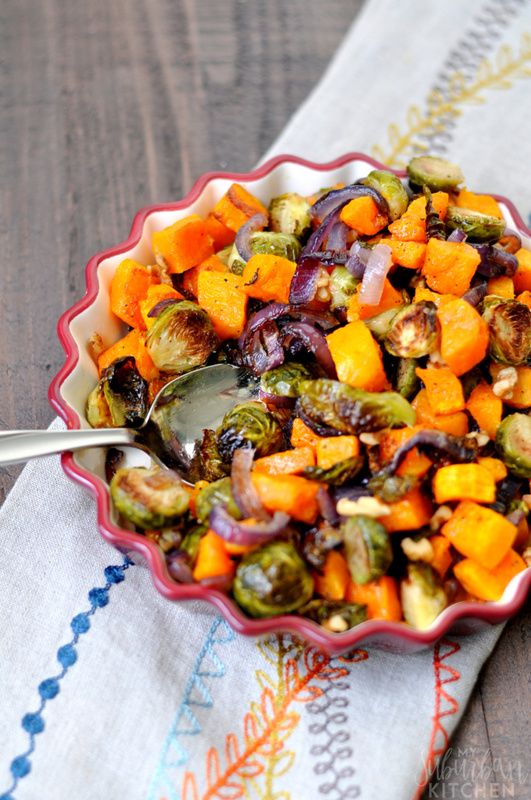 I love these kind of roasted veggies. Thanks for sharing with us at Family Joy Blog Link Up Party this week! 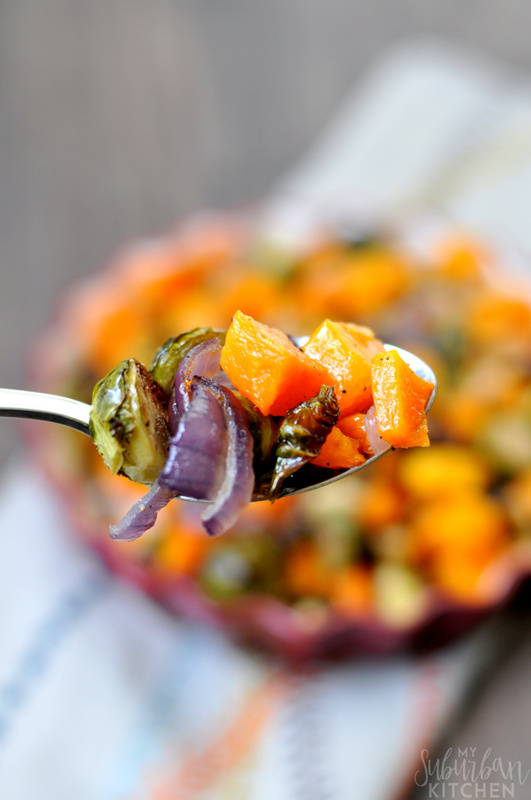 Such a delicious and easy side dish! This will be a great addition to the Thanksgiving table! This is calling my name! Looks really good!! Great Thanksgiving side dish! Healthy and full of vibrant color. Going to to try it very soon. Everything in this dish is spot on for me, flavor, color, texture, EVERYTHING! Love it!